I love s’mores. Man oh man, do I love s’mores. Graham crackers, chocolate and marshmallows! Mmmm. Growing up, I never went camping (sad! ), so I’ve never known the joys of making s’mores over a fire in the middle of nowhere. At our house when I was a kid, we had to make due with a lit burner of the gas stove, or make cheater’s s’mores in the microwave. They were still good, and they’re still one of my favorite messy treats for when the weather cools down. There’s no denying how messy s’mores are to eat, which can be sort of an inconvenience! I wanted s’mores that were more portable and user-friendly, so I came up with these. This idea had been in my head for a long time, cause who as a kid didn’t love Golden Grahams cereal? I’ll admit that it doesn’t taste quite as good now as it did when I was 7 or so, but it does make a damn good s’mores bar! 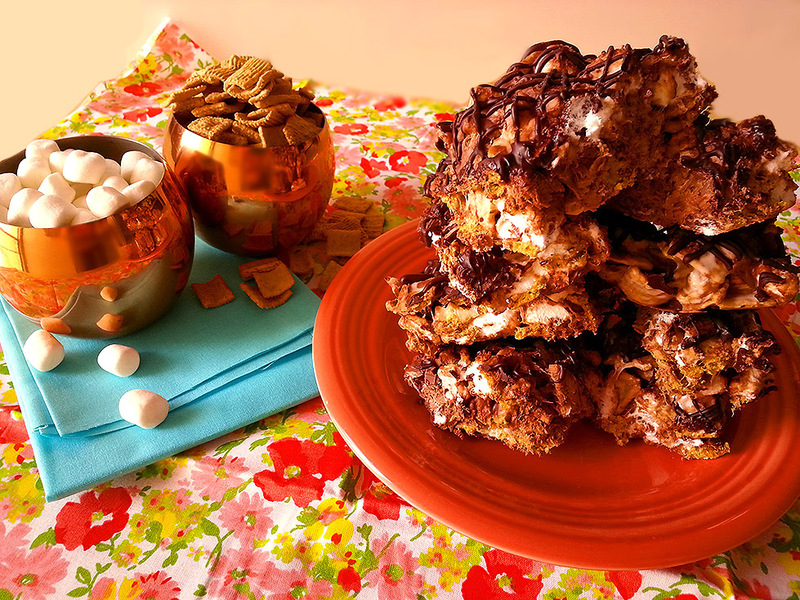 Imagine if rice krispy treats and s’mores had a baby, and this would be it. S’mores bars! How could they possibly be bad? 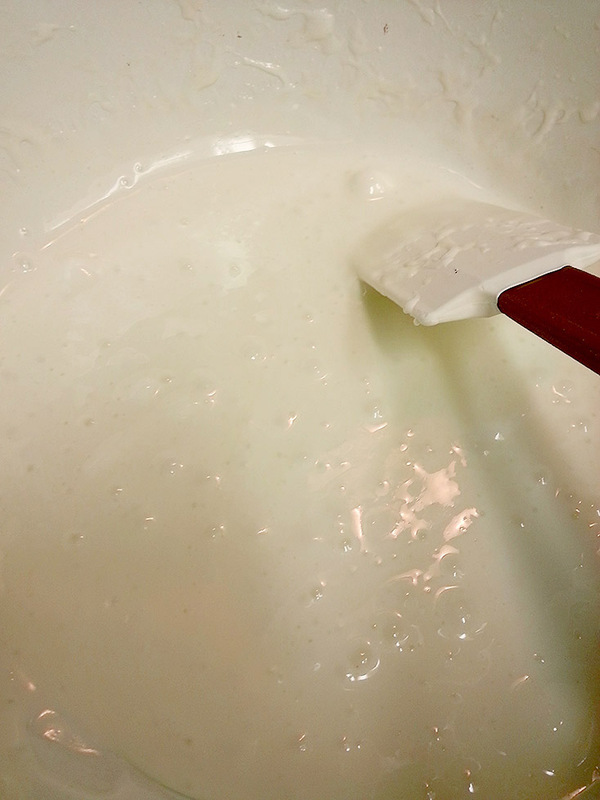 Grease a 9″x13″ baking dish and set it aside. Grab a big pot and put it on medium heat. Throw in the butter until it’s melted, stirring around periodically. 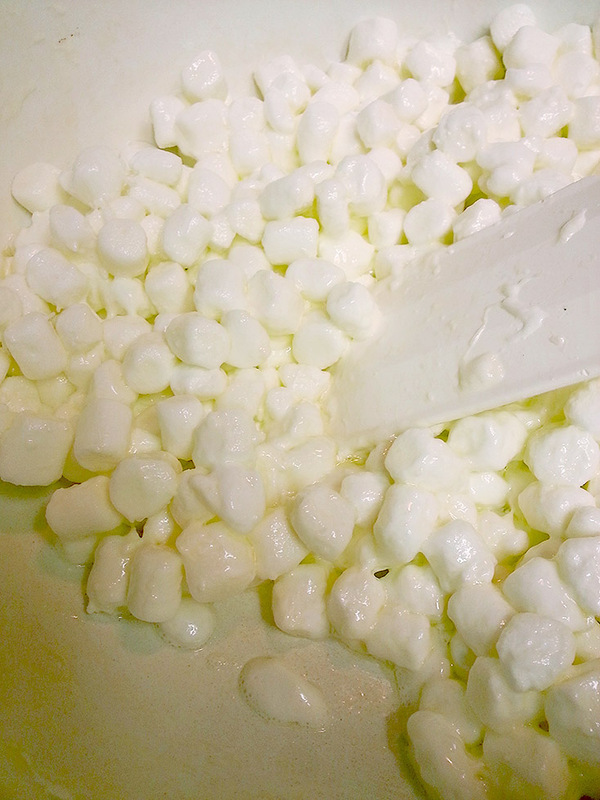 Add in 4 cups of mini marshmallows, stirring constantly with a spatula so they don’t burn! I made rice krispy treats for the first time when I was in the 5th grade and didn’t pay attention, so the marshmallow and butter burned. It was gross. So please, don’t walk away or you’ll risk repeating my 5th grade mistake! 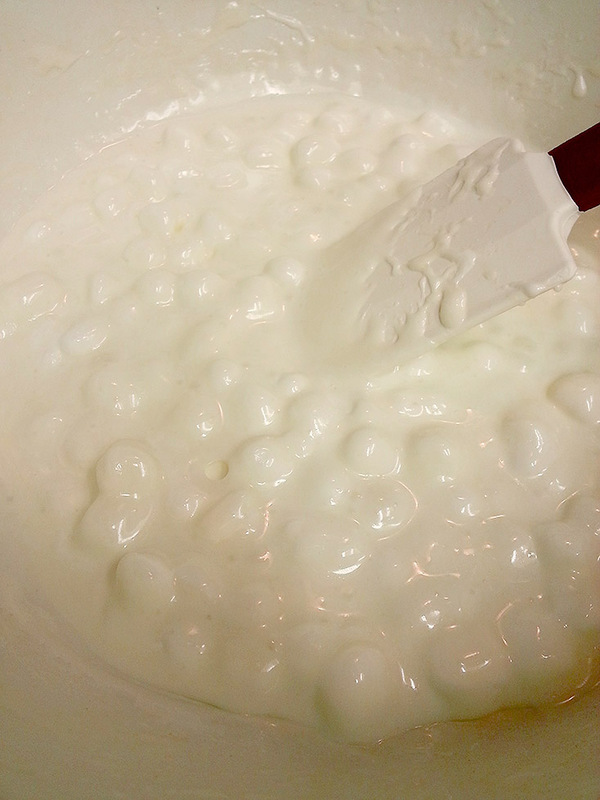 Once the marshmallow is all melty, pull the pot off the heat and dump in the cereal all at once, along with the 3 cups mini marshmallows and the whole bag of milk chocolate chips. 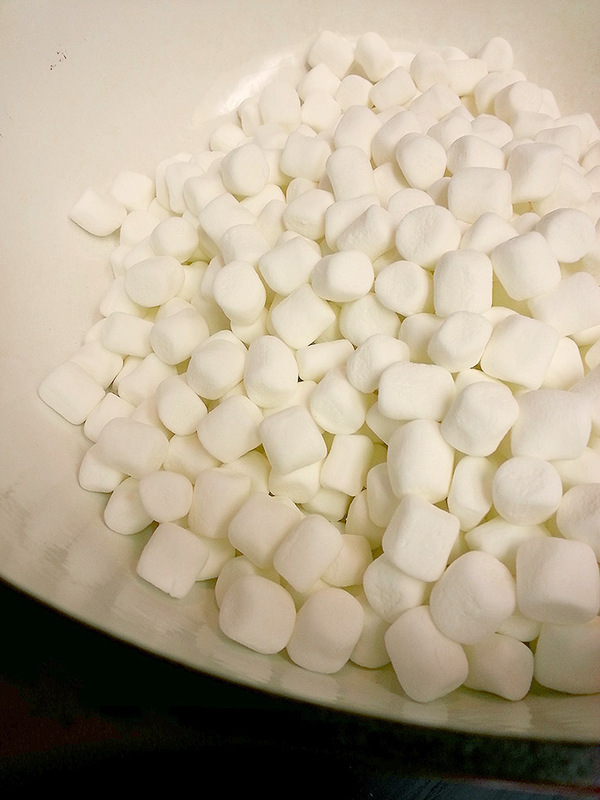 Stir this around really well until it’s all coated in marshmallowy goodness! The chocolate will melt quite a bit, but that’s good. We want chocolate all throughout these bars! 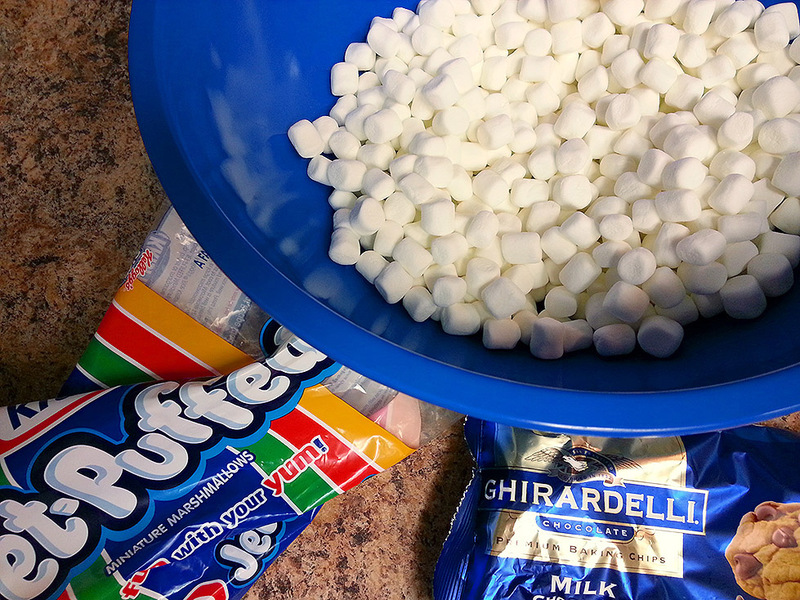 Pour this cereal-marshmallow-chocolate amazingness into your greased baking dish and flatten it with the spatula. Make sure it’s in an even layer, and going all the way to the edges. Chop up your 2 ounces of dark chocolate and microwave it on high in a small bowl until melted, The time will vary depending on your microwave, but start it out for about 20 seconds. Stir it around and hopefully the residual heat will be enough to fully melt all of it. If it’s still kinda chunky, keep heating it for 10 second increments, stirring in between, until it’s all melty. Pour the chocolate into a small piping bag or a Ziploc bag with a tiny piece of a bottom corner snipped off (or, you can just drizzle it over the top with a spoon). Drizzle this chocolate allllllll over the top of the s’mores bars. It’ll add a little depth to the whole situation, since they are sweet little bars. Put the dish of s’mores bars into the fridge to firm up, at least an hour. Using a sharp knife, cut the bars into 4 even pieces short-wise, and then cut these 4 pieces in two so you have 8 narrow strips. Cut these strips into 3rds lengthwise, so you end up with 24 skinny rectangles. Use a butter knife or a pie spatula to remove them from the pan. They can be stored in an airtight container or a large Ziploc bag in the fridge or at room temperature for up to a week. As I said before, the Golden Grahams cereal is nothing super special on its own, but when you combine it with melty marshmallows and sweet milk chocolate, it becomes something else entirely! I literally could not stop eating these things, so I had to bring about half of them to work so I could get them out of my kitchen. My co-workers didn’t seem to mind one bit! This is the perfect snack to make now that fall is approaching (come on, there’s no denying it now! ), and a wonderful snack to make for all your fall-season football tailgating and parties. It’s so simple, the kids can definitely help out, too! What are you waiting for? Next Next post: power to the (pizza) people!